Mondays are tough, as are Tuesdays – heck, the whole week can be tough sometimes. Why not have something that makes you smile during those tired mornings? I recently picked up the Happy Face Mug from Pier 1. 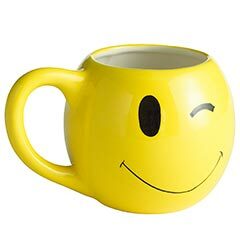 The bright yellow mug is absolutely adorable. It has a smiley face on one side and winking face on the other – that way if you have crush on a co-worker, you can make sure that side is showing during your morning interactions (not that I would ever recommend dating a co-worker, but that is beside the point). Drinking coffee has never been so enjoyable. My co-workers have grown to know my cup and put it on my desk every day before I get in to work. It is the little things in life, and for $6.00, you can’t get much better than that.